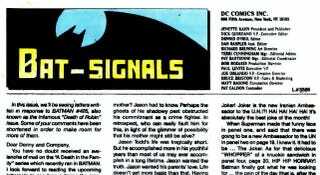 DC comics is bringing back letters to the editor. Will you take advantage? Last year comic books jumped another dollar, from $2.99 to $3.99. In response, fans began leaving a lot of stuff on the shelf. People might like comics, but not if each issue takes a big bite out of a ten dollar bill. After some deliberation, DC dropped its prices back down to $2.99, but at a cost of two pages of story. People grumbled a bit, pointing out that many $3.99 stories had back ups that bumped them up to 30 pages and that the drop of one dollar for ten pages meant they were paying more per page. DC is taking us back up to the traditional 22 pages of content, however, replacing two pages with something new. Or rather, something very old. Letters pages used to be the back end of all comics, sometimes in more ways than one. There are a few famous letters that are distinctly - how shall we put this - of their time, such as one describing how Batgirl should be more deferential to Batman and Robin because they are men. Since the internet has overtaken the letter in speed, accessibility and willingness to pander to the lowest common denominator, letters pages have disappeared. Will they be popular now? Will you be sending them a piece of your mind?